Blues Pub is a student run bar that occurs on a weekly basis in the McConnell Engineering Common Room. A long withstanding tradition in the faculty of engineering, Blues Pub is a place to gather, drink beverages, and relax from a long week of trying academics. 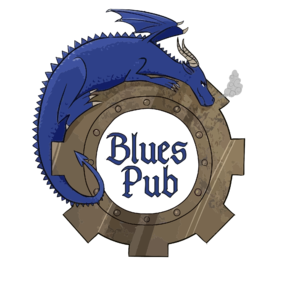 Each Blues Pub is unique as it is organized by a different host, who is in charge of the volunteers, theme, and hype. Here you will find champions proving their worth in games of beer die, friends, and again, beverages. You must be 18+ to be at Blues Pub, IDs are checked at the door. Volunteering is a lot of fun! There are two primary spots you can volunteer at, either the food station or the bar. Often times at busier Blues Pubs, a volunteer may be required at the door. If you're interested in volunteering, email the Blues Pub Managers. The Food station is Hell's Kitchen (in a fun way?). There are two jobs at the food station, however it is recommended that there are at least 3 volunteers at all times to help out here. There is the cashier, who takes the orders, collects cash, and who oversees the exporting of Plumber's Pockets. Then there is the cook, who (under all sanitation standards), makes the food as dictated by the cashier. The third volunteer is encouraged to help where necessary, be it aiding the cook, contacting a manager for additional supplies, and so on. Overtime the bar has become a well oiled machine, which only elaborate tomfoolery can mess up. While all of the servers are required to be server trained, you do not necessarily need to be server trained to help at the bar. It is strongly encouraged that there is a barback at all times at the bar to refill the bins, get more reusable & disposable cups, and oversee the well being of the bar in general. Barbacks do not need to be server trained! There should be at least 5 members serving at the bar at a time; however less are needed in the first hour of Blues Pub on average. Unlike other student run bars, Blues Pub is hosted by a different group every week. This is because the profits of Blues Pub go to the hosting organization; that is to say, that Blues Pub is intended to help groups generate an additional source of revenue! Hosting opportunities are limited to EUS organizations and departments, as there are few spots available every year. 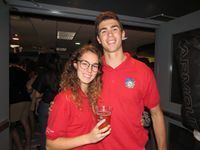 It is standard that departments receive one Blues Pub a semester receiving priority, while other organizations may apply for one Blues Pub a year. It's not uncommon for tertiary organizations with the EUS to share the responsibility of a Blues Pub, sharing the wealth. Hosting is allocated over the summer proceeding the academic year. Tabling is available to all groups who wish to promote their organization to the patrons of Blues Pub; however, engineering groups still receive priority! Tabling is a free form to get in touch with patrons, providing games, a point of sale (as long as it's non-competitive with the hosts of the Blues Pub), and more! If you're interested in tabling for the 2016-2017 year, please apply through this form. Behind the scenes of every Blues Pub is a dedicated team of managers. This team has the knowledge to help acclimate the new hosts every week, lending a hand when necessary and teaching volunteers new skills.